This series of workshops covers various methods of adding image and color to metal. Using pens & computer printed imagery participants etch metals with ferric solutions and salts to nitric baths. Create contrast with Liver of Sulphur. Deep etch copper and inlay with silver. Participants will deep etch copper pieces and fill the impressions with silver, through sanding/filing create a uniform surface. Electroforming: grow copper onto organic forms. Gradually grow copper over natural forms, wax and glass, that can then be plated with gold or silver solutions or enamel these copper forms with vitreous enamel (glass powders). Plating: brush plating and pen plating are covered. Participants plate their electro-formed objects. Anodizing: working with Titanium and/or Niobium participants learn how to apply color to metal using electricity. Anodized work can be stitched, riveted or linked to copper/sterling silver. ALL materials included: Copper & Sterling for etching, etching/plating solutions, wax for sculpting items to be electro-formed, Titanium kit for anodizing, etching resists. Students supply organic materials for electro-forming: acorns, pods, leafs, glass beads, etc. $575 includes all materials, selection of stones and fossils for setting, wax, saw blades, glass, and more! 6 student max, 3 student minimum to run. Ages 13 on up are welcome! Deposit of half down required to hold space. remaining amount due the 1st day of camp. 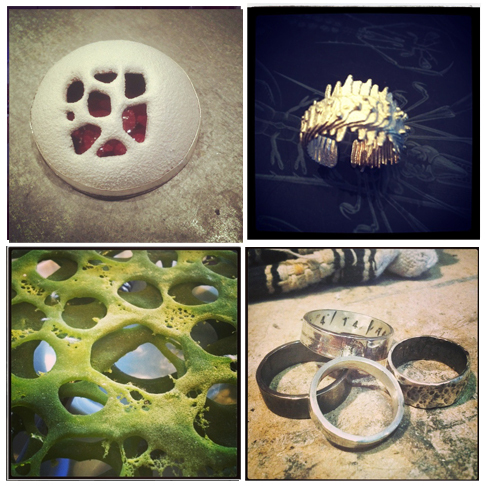 This ‘camp’ covers many aspects of metal-smithing and working with cast glass objects. Participants receive copper for FOLD forming, sawing/fabrication, enamel on copper, riveting (Sterling silver will be available for purchase towards more elaborate projects, though not mandatory) Cuttlefish bone ring band casting, lost wax casting of glass, learn how to cold connect and simple prong/tab settings for your glass castings or pick from our fossil collection and turn that into a pendant! 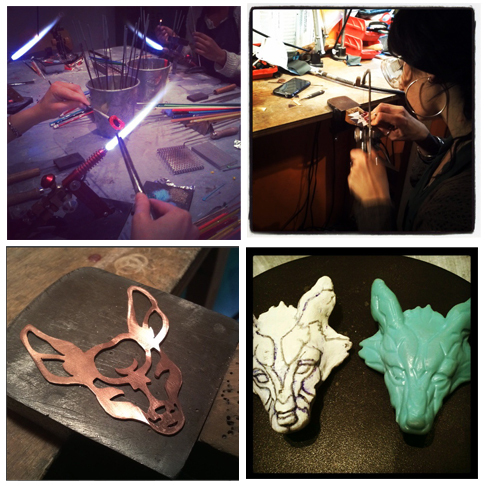 Participants leave with a new set of skills, and a minimum of 5 to 6 pieces created by hand. No experience necessary!